Posting bond is to assure the defendants appearance in court for a misdemeanor or felony case. Bond can be personal recognizance, 10%, cash or surety. The Judge can impose conditions of bond. Bonds may be posted 24 hours a day 8:00a.m. to 4:30 p.m. at the Clerks office and after hours and during the weekend at the dispatch window at the Ashtabula Police Department. Personal Recognizance: A personal recognizance bond requires only the defendants signature guaranteeing the defendant’s appearance. Failure to appear after signing a personal bond is punishable by six months in jail and/or a fine of $1,000, regardless of the out come of the original charge. Plus the defendant may be charged the amount of the bond. 10% : The defendant will post 10% of the bond amount. All receipts are in the defendant’s name. When the bond is returned, it will be returned less 10%. The bond may also be ordered applied to the defendant’s fines. Cash/surety: The defendant has the choice of depositing the full amount of the bond or using a professional bonding company. The Court cannot recommend a bondsman. Cash: The full amount of the bond has to be posted. The full amount is then returned to the defendant. THE JUDGE NORMALLY ORDERS BONDS TO BE APPLIED TO OUTSTANDING FINES OR COURT COSTS, BEFORE RETURNING THE BALANCE TO THE DEFENDANT. IF THE DEFENDANT FAILS TO APPEAR FOR HIS/HER HEARING THE BOND MAYBE ORDERED FORFEITED AND A BENCH WARRANT WILL BE ISSUED. A NEW BOND WILL BE SET. ALL BONDS MUST BE PAID BY CASH OR CREDIT CARD. NO PERSONAL CHECKS WILL BE ACCEPTED. 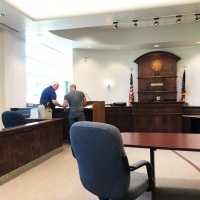 The criminal cases heard in the Ashtabula Municipal Court are misdemeanor charges that carry a maximum penalty of twelve (12) months in jail and a maximum of $1,000. Felony cases are filed here for Preliminary Hearings (probable cause hearings) only. If probable cause is found final disposition will be heard and determined by the Ashtabula County Common Pleas Court. The criminal division schedules all hearings. If a case is set for Pre-trial or Trial a continuance is to be submitted in writing 3 days prior to the hearing date. The Judge is the only person that can grant a continuance. We do except fax filings.